The Tarlton Law Library is proud to have in its collection of legal documents a Jewish marriage contract, or ketubah (pl. ketubot), dating to Qajar-era Iran. The ketubah belonged to Asher Ben Avraham and his bride Zilpa Bat Shaul, who were married in Ifsahan, Iran on April 10, 1914. 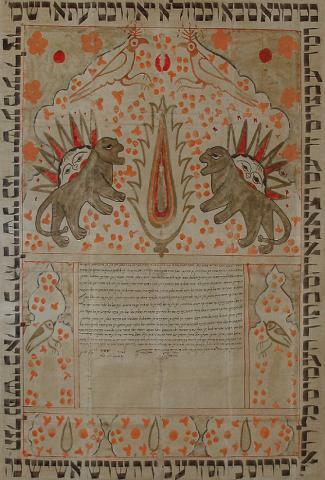 The contract is written in Hebrew and Aramaic and adorned with images of peacocks, lions, and suns typical of ketubot written in the region at the turn of the 20th century. While the official state religion of Iran is Islam, Jewish communities have existed in Iran for centuries. The city in which this ketubah was written, Isfahan, was home to one of the earliest Jewish settlements in Iran dating to the fifth century CE. The Jewish quarter in Isfahan became so large that geographers came to refer to it as al-Yahudiyah, or "The City of the Jews." The status of Jews in Iran has fluctuated over the centuries but the Constitutional Revolution of 1906 meant that Asher and Zilpa lived during a time that Jews had elected representation in government and freedom to live, work, and practice their religion freely. With origins dating back to biblical times, the ketubah is an important component of the Jewish wedding ceremony. In the ketubah, a husband vows not only to support his wife financially during the course of their union but also to provide a monetary settlement to her should she be widowed or divorced. The practice is presented in the Talmud, or Rabbinical law, as a way to both safeguard a woman's right to financial compensation and as a means to discourage divorce. In early Jewish societies this served to prevent widows and divorcees from becoming a burden on society as the sum could be used for a dowry in securing a new marriage. Ketubot remain an important part of Jewish weddings today. If you would like to view the ketubah, it can be found on the east wall of the Tarlton Law Library's the third floor. For resources on Jewish law, search for Talmud in our online catalog or browse the stacks for items with call numbers beginning with BM, found on the third floor of the library.